Mr. Gert Stephanus Schoonbee was born on the 6th of February 1929, in Middelburg, Transvaal. He matriculated in 1948 from Hoërskool Erasmus in Bronkhorstspruit and continued his education at the University of Pretoria, studying BSc Agric. He started farming on completion of his studies in 1950, where he mainly focused on tobacco, cotton, maize and cash crops in general. 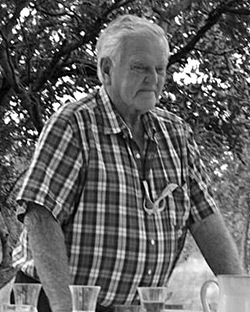 During these early years he identified the shortcomings of the farmers in the Loskop Valley preventing them from prospering and he subsequently started organizing the farmers into study groups. The farm has grown with the passing years into an esteemed source of wholesome produce. The official registered company of GS Schoonbee Landgoed (Pty) Ltd was founded in 1971. Mr GS Schoonbee was no ordinary person to say the least about the man that achieved many accolades spanning over 66 years. Being a farmer is tough enough, but serving as Chairman and Member on various councils/boards within the agricultural arena in South Africa has placed him amongst an extraordinary group of visionary farmers. This clear vision together with the interests of his fellow farmers at heart, created a stern belief that assisted with the extension of the Loskop Dam wall by 9 meters in 1967. His knowledge and experience proved most valuable during the extreme droughts recorded in 1985 and in 2016. The full impact of the droughts on the Loskop Valley agricultural community was minimized due to the now greater capacity of the Loskop Dam. The Loskop Valley was his home; the soil was his blood and his people the heartbeat. He challenged the best to be better, faster and harder. He had a “never give up” attitude and iron will that echoed to each person that had the privilege to meet him. We sincerely believe that the quality he engraved in the people will be seen for generations to come. Schoonbee Landgoed situated in Groblersdal, is nestled in the heart of the flourishing Loskop Valley irrigation scheme, within the boundaries of the majestic Limpopo province. This family-owned farm which features incredible views is synonymous with offering unparalleled quality to its global customer base. The acclaimed farm boasts three main product areas spreading over nearly 3000 hectares. Although Schoonbee Landgoed is in the production industry, they view their employees as their most valuable asset. The farm recognizes that the skill, dedication and enthusiasm of their team are crucial to their success. To support their valued workforce it was imperative to ensure their continuous employment during the entire year. The management decided to expand the small established citrus orchard with the planting of an additional four hectares of citrus per one hectare established grapes. With the current 919 hectares of citrus and 451 hectares of grapes, the workforce is employed during twelve months of the year. Today a wide variety of citrus including lemons, navels, valencias, soft citrus and table grapes are produced and exported throughout the world. The farm is also involved in game breeding projects with exotic and indigenous game. Schoonbee Landgoed has earned its reputation over the last years due to its unwavering commitment and passion to satisfy its valued consumers’ needs and expectations. It excels in the critical areas of quality assurance, food safety, traceability, environmental responsibility and social accountability. Our passionate team harness a united vision where they recognize and share the environmental aspirations of our local community and customers. Through their continued dedication environmental friendly and sustainable practices were implemented shrinking our carbon footprint, without compromising production. Schoonbee Landgoed is committed to preserve and improve our social and environmental heritage, by supporting local business and social endeavours. Loyal, passionate, honest, positive, transparent and creative are just some of the words that describe the Schoonbee Landgoed team members. Their focus and passion is unrivalled and allows for an unparalleled quality atmosphere where each employee can shine daily. The team at Schoonbee Landgoed agrees that unity is strength and that when there is teamwork, passion and collaboration, amazing things can be achieved. Schoonbee Landgoed employs approximately 500 permanent employees and an additional 1500 temporary workers seasonally depending on the respective season. Each personnel member contributes to the farm’s success. We commend each of our valued team members for their continual involvement. Together we ensure Schoonbee Landgoed, Limpopo and South Africa is a great place to live and work. Want to join our team? Visit our Careers Page for more details!